So, on 10/21/2016 I was in a car accident. I was the passenger, and the driver I was with wasn’t at fault. I completely borked my knee. That, in addition to my new job, is why I haven’t been able to update the site much in the past little while. My old job left me with a ton of spare time…so I spent a lot of it adding content to the site. But, my new job is not only a lot busier, but my website (for some reason) is blocked at work so…no updating at work. My work friend and I had just eaten lunch (which was fantastic by the way) at this Peruvian Chicken place. It was a Friday, and our office let us out early because it was the end of the busy part of the month. We were driving back to my place so that he could drop me off (I walk[ed] to work, so it was the easiest way to get back home). We were driving right past one of the largest hospitals in the city, and someone pulled out right in front of us, and hit us pretty much head-on. We were only going 35, so I was surprised that this happened. I think part of it is because I have a habit, as a passenger, of hitting the “invisible brake pedal” so my leg was planted firmly on the floorboard in front of me. After the crash, the first thought that I had was that I had trouble breathing – the smoke from the gunpowder charge in the airbags was hanging heavy in the car, and I wanted to get out. It smelled like I had gone to a gun range with no ventilation, or had just shot off fireworks. My door didn’t open, so I had to crawl across the center console. As soon as I started to move, I realized my right leg hurt like hell. I bunny hopped to the front of the car and leaned on the hood. Luckily, an ambulance was close by (we wrecked right in front of the hospital) and since I couldn’t put ANY weight on my right leg or walk, I took a short ride to the ER. I waited there for an hour or two before being taken back to see a doctor. They did a few X-rays, used ultrasound to check for internal bleeding, and finally after a little while an orthopedic surgeon came in to talk to me. 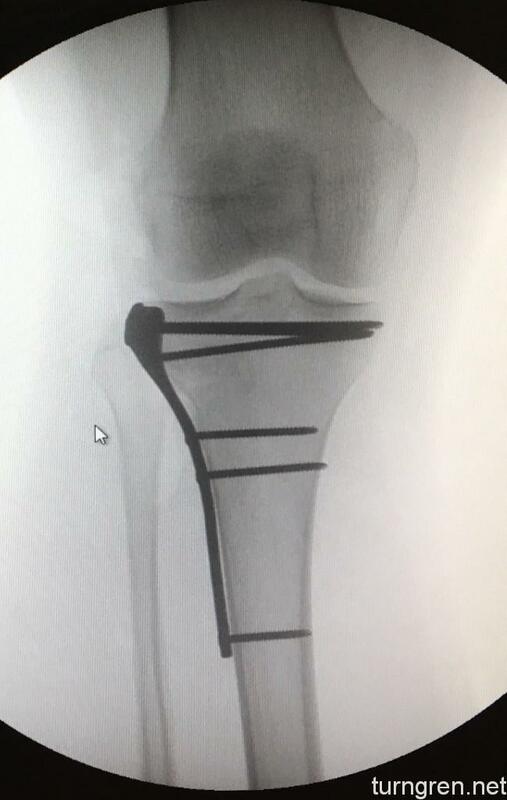 I had a tibial plateau fracture. The tibia is my shin bone, and the plateau is the top surface of the bone that interfaces with my thigh bone in my knee. Part of the outside edge of the top of this bone broke off and slid down, or as they say, became displaced. That was why I couldn’t put any weight on my leg without it buckling in a white hot flash of blinding pain. They opted to keep me overnight for observation, apparently due to the risk of blood clots and a swelling-related issue that is common after high-energy fractures called compartment syndrome. It can cause tissue death, so they wanted to keep an eye on me. The next morning I received a set of crutches, and some PT folks came in to show me how to use them. I had a splint on my entire lower leg, so I couldn’t bend my knee at all (which was a great help because stabilizing it made it hurt a little less). They gave me some pain meds and sent me home with instructions to call a surgeon the following Monday morning to schedule an appointment. Apparently, if a fracture is not displaced, it can heal without surgery, but if a displaced fracture is left on its own, it will heal improperly leading to a high likelihood of arthritis and other knee problems in the future. Of course I wanted to avoid that, even though the prospect of surgery wasn’t exciting to me. I was scheduled for an appointment the following day, to get info from the surgeon and to learn a little more about my prognosis and what would happen. I crutched down the 3 flights of stairs I live atop, and rode to the surgeon’s office to meet. He is very knowledgeable and spent a good bit of time with me, answering all my questions. Surgery was scheduled for 10/31. I found out that day that I wouldn’t be able to put weight on my right leg for 3 months while the tissue and fracture heals. I also can’t drive, because if I have to slam on the brakes or something similar, I will re-injure the tissue. I went under around 7:30, and woke up around 10:00. They used some cadaver bone to replace the mass that was mashed up in the crash, and put in a plate with a few screws (see x-ray above) to stabilize the bone while it heals. My leg was in a dressing, which I was able to take off after 5 days. I stayed in the hospital that night as well. This was a little rough – because my bladder doesn’t play nice with anesthesia…it takes another day or so to “wake up” and for me to be able to pass urine. I warned the anesthesiologist that I experienced this after a hernia surgery in 2012, but he assured me that it is common in hernia surgeries and probably wouldn’t happen again. He didn’t think putting a catheter in while I was under was necessary. So, a few hours after I wake up, I start to have to pee. That’s when I get nervous. I crutch to the bathroom (painful) and no matter what, I just can’t go. I wait another hour or two until I really have to go, and try again. No dice. Time to call the nurse and get this over with. She comes in, I explain, and she brings in a machine that uses ultrasound to measure how much urine is in my bladder. 950 ml. 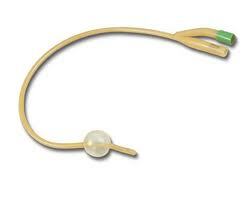 Looks like a catheter is necessary. 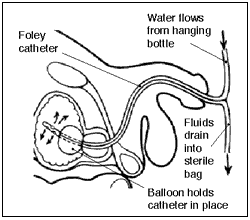 I asked for a Foley catheter, which is the kind that can be left in for several days, because I only wanted to do this once. She talked to the other nurses, and they wanted to do an “in and out” catheter in hopes I could pee the next time my bladder was full. It went in – not pleasant to say the least – but it felt good to be drained. Just look at how awesome and comfortable this thing looks. 6 hours later, same thing happens – but this time they opt for the Foley. I had that in for about 12 hours into the next day. I wanted to go home with it, and come back in a few days to have it taken out, but they wanted it out before I went home. I was nervous – I didn’t want to get it pulled out (also not pleasant) only to have to have another one put in. But, they pulled it out around 3PM, and I started drinking as much water as I could. By 4 I really had to go again – and I was able to. Three hours later, I was on my way home. The band-aids cover two small single-suture wounds, I assume to stabilize my leg or something similar. I covered them because they tended to get caught on things more than the main incision. BOY did it itch. But getting the dressing off was still a huge improvement – now I could shower. I hadn’t showered in almost a week. A week later, I was able to make it upstairs to sleep in my bed. The couch was getting super old, and was really making my back hurt. 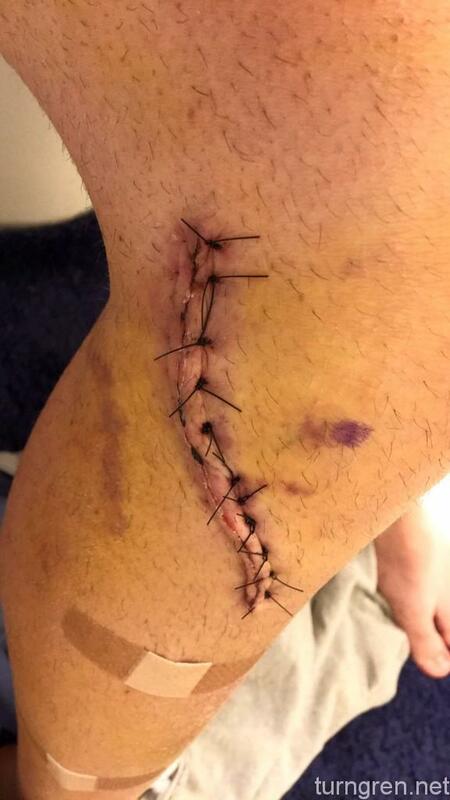 A week after that, I went back to the surgeon to get the stitches taken out. It was a little painful, but compared to everything leading up to it, it wasn’t that bad. So that got me pretty much to where I am now. I’ve been out of the house a few times, the pain isn’t that bad at all (unless I overwork my knee too much), and showers are happening much more frequently, with the assistance of a bench I ordered on Amazon. 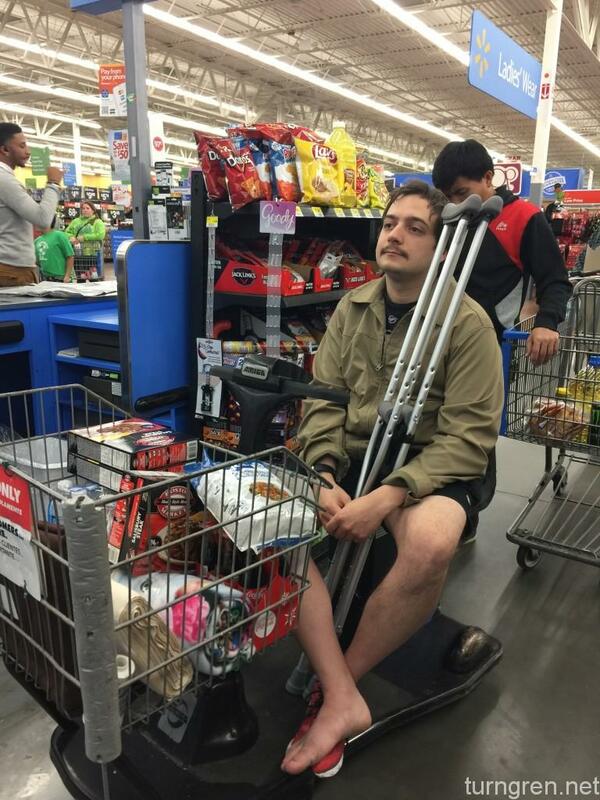 I was even able to go to Wal Mart to get some snacks. I’ve become a little bit of a Frozen Dinner Connoisseur. Since then, things have been looking up. I still have almost two months until I will be able to walk without crutches, or at least put weight on my right leg, but I’ve been working on exercising my muscles and increasing my range of motion as much as possible so that once I start, I will hopefully pick it up quickly. It’s like riding a bike, right? Can’t wait to find out. Everyone has been great to me. I’ve had people taking turns taking care of my dog, and my girlfriend especially has been amazing. She dropped everything she was doing to take care of me. She even put up with me growing an awful mustache after I explained that it was just one small thing I could do to bring myself some joy while being home bound. Even after all of the above, I’m a pretty lucky guy. 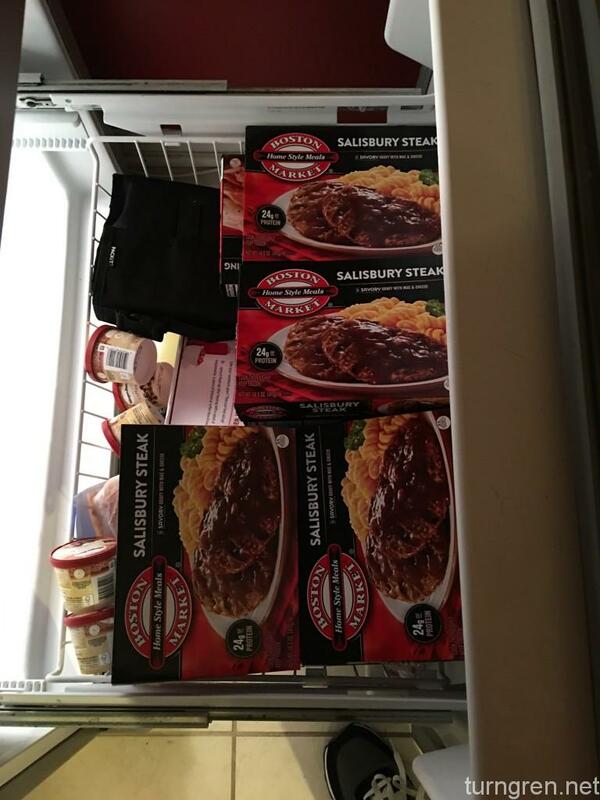 I hope to add some frozen dinner reviews in the coming days.